Pouring concrete slab whether it is concrete slab floor, concrete patio slab, or monolithic slab requires very careful planning. 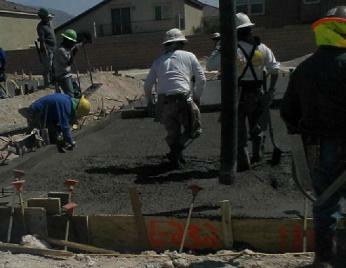 The concrete pour usually takes a day but the process leading up to the pour can take weeks to prepare. This page is about the necessary procudures required for a successful concrete slab construction. 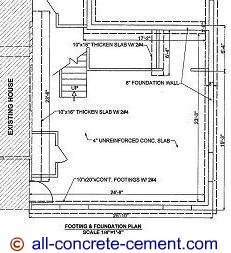 To illustrate the procedure, let's consider the footing & foundation plan shown here. 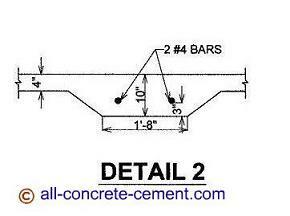 Before pouring concrete slab, you must know how much concrete to order. The formula for calculating the concrete quantity is L x w x h(L=length, w=width, h=height or thickness). Substituting the numbers into the formula we have: 25.17’ x 24.25’ x 0.33’ = 201.4 cubic feet, divide by 27 to convert to cubic yards, the result is 7.5 cubic yards. Since the two interior footings will be poured monolithic with the slab, we need to add the amount of concrete to the 7.5 cubic yards calculated above. Per detail 2, the total thickness is 10 inches. Four of the 10 is already included in the slab calculation, we need to add 6 inches. The two interior footings: one is 23'-6" long, the other is 6'-4" long. Both are 16 inches wide. Combining the two footings we have a total length of 29'-10". Using the same formula used above we have 29.83'x1.33'x0.5' = 19.84 cubic feet. Note detail 5 show 1'-8" but for this calculation we are using 1'-4" because that is the footing width per plan. From detail 2 we need to add a little for the part of the footing that is flared, let's assume a 4 inches wide and 6 inches high. Combining the two triangle make a 6"x4" rectangle. Using the same formula: 29.83x0.33x0.5 = 4.92 cubic feet. Total concrete for the interior footings are 19.84+4.92 = 24.76 divide by 27 to convert to yardage equal 0.92 cubic yard. Adding the 0.92 to 7.5 for slab yields 8.42 cubic yards. Concrete is sold in quarter yardage so in this case we will be ordering 8.5 yard of concrete. When you call to order, you will be asked what mix you need. Since this is interior floor slab, your mix will be 3000 psi.